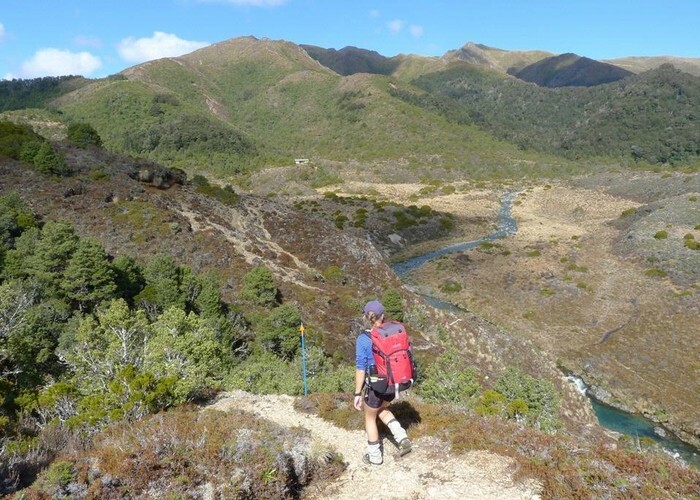 DOC have re cut an old track that gives access to the Middle Range from Waipakihi Hut. The usual route via Junction Top crosses private land and requires a permit. Going by this route avoids the Private land altogether. Above Waipakihi Hut • By Briar. Licence: C.
The track starts a few hundred metres below hut with signpost at riverbank pointing across terraces, marker poles across terrace to bushedge to avoid some wet swampy areas. It then enters the bush and climbs directly to bushline. Added 27 April 2009 by pmckepmcke. 3 revisions, most recently 19 May 2011 by pmckepmcke. 56 views in the past year (5 per month).